This year we have a nearly traffic free course which means we have employed a Highways Management Contractors to put road closures in place on the course this as necessiated an increase on last years entry fee.The course is now a fast loop and the section of route on the main road B4008 which goes in the direction to Stonehouse and Stroud which is a mile in length which is a busy road for motorized is no longer a part of the course route. Wilsonanne691@aol.com There will be no entries on the day. The course is Traffic Free. 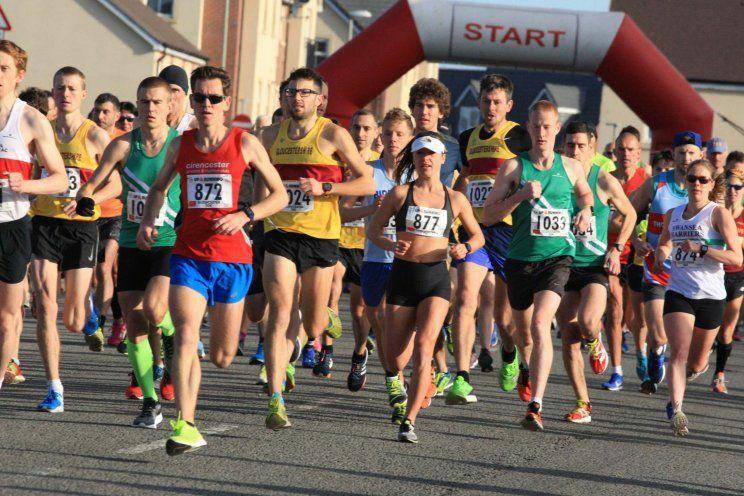 Anyone who has lost there race number and chip or did not receive there race pack in the post will need to go to the help desk at registration and General Enquires on the day of the race between 8.30am to 10.00am. Baggage can be left at Severn Vale Sports Centre, School Lane, Quedgeley, Gloucester GL2 4PR. The course Just under two laps in Quedgeley followed by a one mile section to the main loop then 4 laps of 5.5 miles then 1 mile to the finish. The course has a UKA Certificate of Course Accuracy. First Aid and emergency cover is provided by Local Medical Services. There will be Staff on duty on the course and first Aid station at the Finish. All Finishers will receive a specially designed medal and a special Tech T-Shirt at The Finish. These will be put up on the wall by race registration and where the prizes giving will take place in the Sports Hall these results will be put up in intervals. Full results will be available on our Websites www.beyondthelimitations.org.uk and https://Gloucestermarathon.co.uk. No Competitor will be able to win two prizes: If a veteran athlete finishes in the first three Positions they will receive the Individual prize. You must collect your prize on the day of the race. No prizes will be sent out in the post to your home address. Charles Whitton photography Sports Event will be taking pictures of the Runners in the event you will be able to order your photos online through a link on the Front page of our websites or go onto www.charleswhittonphotography.com Mobile 07798 735455.